Updated 3 July 2014 – thanks to Karen for the great images…. Plus spare blank cards to write your own words….. Sort these words into 5 categories ‘er’, ‘or’, ‘ist’, ‘ian’ and ‘other’. 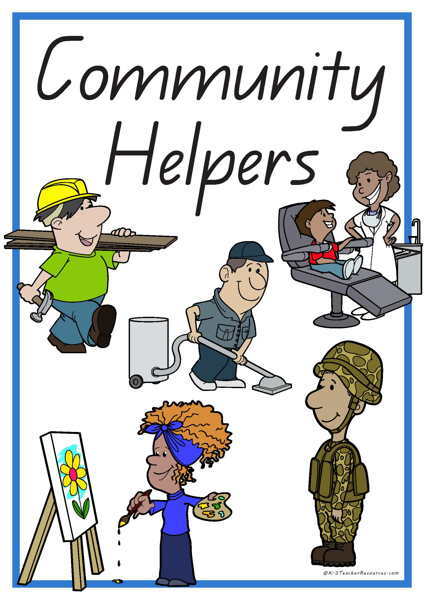 There are many more community helpers and occupations, brainstorm more as a class or in groups and pop them in the correct category above. Extra blank cards are available with the above download. They can be printed out and extra words can be written on to add to this theme group. There are heaps of phonics opportunities with these words….play around with them – what patterns can the children find, circle the patterns, colour them in – make it fun. Print off small size black and white copies to do this – see below. You can make these words smaller size by using the reduction settings on your printer and just printing off black and white copies, these smaller sizes are great for cut and paste activities such as cutting out the words and pasting them in alphabetical order, or into the categories as mentioned above. Use these smaller words to ‘make sentences’ – older children could make up sentences by gluing these smaller words into their books and writing in any extra words needed – kiddies love doing this….draw a picture to go with the sentence…. Use these words (either smaller words for gluing, or as a reference for their own writing) with the concept book – ‘Community Helpers’. Print out the bright full copies, glue them onto colourful backing card – laminate and make an Our Community wall display. These are then ready for children to refer to during writing sessions. Make a jigsaw puzzle. Make up a second set of cards, cut the picture section off using a zigzag or curve cut like a jigsaw (you can even cut through the word to make it more of a challenge) Children then match the 2 pieces. Ask parents to come in and talk about their occupation.